Clonbur in Ireland-West is a perfect choice for a great holiday or a fun short break in County Galway. Find out more about Clonbur below. This cosy apartment boasts the perfect village location in the heart of Clonbur which is snugly located between Loughs Corrib and Mask making this a fisherman's paradise. Tastefully furnished throughout with all mod cons this is a real couples haven only a stroll from the craft shops, pubs and restaurants Clonbur has to offer. Another place of unique beauty is Lough Coolin, a small lake set like a glittering gem in the foothills of Mount Gable, just 3 miles from Clonbur. For the more adventurous, Mount Gable is an easy climb of about one hour's duration. Whatever your taste you are sure to be impressed with this stunning area and long to return to year after year.Shop. Pub. Restaurant 100 yards. Beach 35 miles. GF: lounge/kitchen/diner, double with single, shower room.Electricity by meter read, storage heaters, wood burner with starter pack, linen and towels included, travel cot, high chair, TV, CD, freezer, fridge with small ice box, microwave, washer/dryer, hairdryer, uk tv channels, welcome pack, on street parking. Sorry no pets. We have the following details listed regarding Clonbur accommodation accessibility but we would recommend that you always confirm these prior to booking with the owner or operator. Clonbur is a great base to explore the wonders of County Galway and you will find plenty of activities near by. Clonbur is at Joyce Country, County Galway. Check out the map below for directions, use the controls to zoom in. If you have stayed at Clonbur why not add your thoughts, comments, pictures to our Facebook page? Don't forget to add the name/town/page link to your comment so its attributed to the correct place. Please keep it polite, we are sensitive souls! Find Cottage Holidays works closely with independent cottage owners and leading holiday travel operators to provide you the widest choice of self catering accommodation across Ireland. 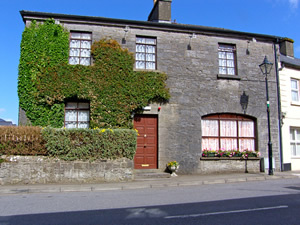 Clonbur in County Galway is available through: Imagine Ireland.